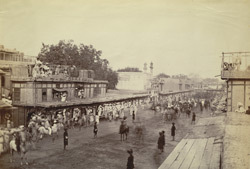 Photograph of the Cantonment at Peshawar, now in Pakistan, from the Macnabb Collection, taken by an unknown photographer in 1865. This is a general view of the city with a church on the right. Peshawar has always been important strategically as well as being an ancient trade route, due to its location close to the Khyber Pass. It was known as the 'City of Flowers' when during the 16th and 17th Centuries the Mughal Emperors built many garden mosques and monuments there. The city was a British Army cantonment from the mid 19th Century, and the capital of the North-West Frontier Province from 1901.